2 weeks before their Grand Fall 2012 New York performance, Bassam Saba and April Centrone, the artistic and the executive directors of the NYAO, will be guests in Middle Eastern Influences at midnight on Thursday, Oct 11th. The 35-piece New York Arabic Orchestra presents contemporary instrumental compositions by Bassam Saba, along with selections of Arabic vocal and instrumental music of Lebanon, Syria and Egypt. The NYAO is comprised of the ‘ud (Arabic lute), nay (Arabic reed flute), qanun (Arabic zither), Arabic percussion, strings, woodwinds, lead vocalists and chorus. Known throughout the U.S. and abroad as one of Arabic music’s finest conductors, Bassam Saba has led the NYAO to prestigious venues such as Carnegie Hall and Lincoln Center and has developed an authentic sound that is regarded around the world. The orchestra consists of professional musicians of a rich variety of backgrounds, many of who have dedicated over four years of weekly practice and intense study. Such committed membership represents the heart of fiber of the orchestra, built upon a collective of multi-faceted, passionate individuals who have devoted a large part of their lives to the exploration of the Arabic culture. 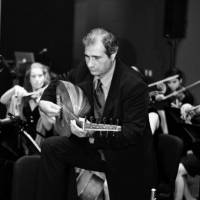 more info on the NYAO on: http://www.newyorkarabicorchestra.org/index.html Bassam Saba is one of the nation's leading figures of Arabic music. Saba is a world-renowned nay virtuoso and multi-instrumentalist, performing on oud, violin, buzuq, saz and western classical flute. Saba studied nay, oud and violin at the Lebanon National Conservatory. At the age of 17, he moved to Paris where he received his BA in Western Classical music and Flute Performance at the Conservatoire Municipal des Gobelins. In 1979, Saba moved to Moscow to study at the prestigious Gnessin Musical Pedagogical Institute where he received an MA in Western Flute Performance and Music Education (1985). He later returned to Beirut where he began to work extensively with the biggest stars of the Arab World: Fairouz, the diva of Lebanon, and composers Marcel Khalife and Ziad Rahbani. more info on Bassam Saba on: http://www.bassamsaba.com/ April Centrone is one of the leading classical Arabic percussionists in America, student of Michel Baklouk Merhej. She has performed with renowned Arab artists such as Marcel Khalife, Bassam Saba and Najib Shaheen. She has also shared the stage with a variety of rock, jazz and avant-garde artists including Les Claypool's Primus, Mike Patton, Trey Spruance's Secret Chiefs 3, Trevor Dunn, and Eyvind Kang, among others. more info on April Centrone on: http://www.aprilcentrone.com/default.html Tune in Thursday at midnight!